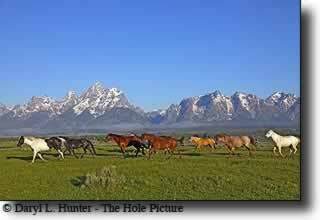 Teton Valley is world famous for its crown jewel, Grand Targhee, that towers over the eastern horizon of the valley. But Grand Targhee isn’t the only option for skiing in the immediate area. Just over the Teton Pass is the Valley of Jackson Hole, home to Snow King resort which is in the town hill of Jackson and is smaller but is affordable and convenient and Jackson Hole Mountain Resort is the destination resort of the three. There’s only one word for skiing at Grand Targhee: extraordinary. Though other words such as effortless, knee-deep, and uncrowded all apply. The key is the more than 500 inches a year that fall on the backside of the Tetons – the snowier Western side – each year. Add to that a skiable terrain of nearly 2000 acres, with more than 1,000 reserved for Sno-Cat Adventures, and you have an experience beyond compare. In addition to Grand Targhee’s legendary powder, families love our corduroy grooming with cruising runs that are a signature of Grand Targhee Resort. It's not only about legendary powder; those who love to carve will begin to salivate just thinking about shredding the pristine corduroy. And if awesome freestyle terrain is on your agenda, look no further. We’ve got two parks plus natural freestyle terrain to get you stoked. North Pole Terrain Park gives everyone a chance to ease their way into the world of freestyle riding. Trick Town takes the action up a notch, with numerous features, including table top, rainbow, flat down flat and flat down rails and more. Center Earth freestyle area is a dynamic playground based on natural features and enhanced with expert grooming. 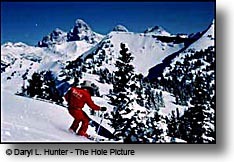 Jackson Hole Mountain Resort offers visitors one of the best ski and snowboard experiences in the world. It is world renowned for its steep and deep terrain, consistent fall line, deep, light powder and endless backcountry, Jackson Hole Mountain Resort also allows beginners and intermediates to excel at their own pace on a variety of groomed runs and open bowls. Jackson Hole Mountain Resort has been rated as the third best ski resort country and who could argue with that. Jackson Hole has 4,200 vertical drop and that drop comes right out of the Grand Teton Mountain Range. These spectacular mountains crown jewel the Grand Teton Towers over the Valley and resort at a majestic 13,770 above sea level. When they say ski the big one they mean it! With 2,500 acres of inbounds terrain, a 4,139' vertical rise, 459" of average snowfall each winter, and unparalleled backcountry access, Jackson Hole offers a truly unique winter experience. Two distinct mountains in the heart of the Tetons - Rendezvous and Apres Vous - make up Jackson Hole Mountain Resort and have been home to incredible skiing and snowboarding for the past 40 years. Whether you're here to experience "The Big One's" wild, untamed terrain, rolling, wide-open groomers, or you're just getting out on the snow for the first time, it's bound to be an experience you'll never forget. Since Snow King’s founding in 1939 as the first ski area in Wyoming, Snow King has served as Jackson Hole’s ‘Town Hill.’ Generations of residents have grown up learning to ski there. It’s a real part of the community, where parents can drop off their kids for after-school turns and adults can do some bump skiing during their lunch hour. But it’s not just a place for townies, its steep terrain will challenge the best of skiers yet has great terrain for the beginner.With Jackson Hole Mountain Resort only a short drive away, Snow King doesn’t bother trying to compete with its high-octane neighbor. Instead, it positions itself as the little guy who just tries harder. With its short-but-steep ski area, ski-in/ski-out accommodations, and ultra-convenient location, I felt right at home at Snow King. It is what it is an unassuming and fun mountain where people come to ski, and not to be seen. Bill Royall chose the University of Denver so he could take the winter quarters off from school and hit the slopes. His powder-searching ways continued after college, landing him in Vail for a few years before it eventually became too crowded, too trendy. A move to Aspen ended with the same claustrophobic result. And so it went, Royall's quest for a quiet skiing sanctuary going on for years, taking him to places such as Steamboat Springs, Taos, Sun Valley. And it always ended the same: moving out when the crowds moved in. The nomadic journey seemed to come to an end about 20 years ago, when he arrived in Jackson, Wyo., a place still oozing with that dusty-floor saloon charm of the Old West. But, like all the other ski towns that had lured Royall with its charms, Jackson changed, attracting fuzzy-jacket-wearing out-of-towners to the slopes, and trendy shops with pricey paintings and sparkly T-shirts eventually lined the streets. Grand Targhee is the kind of place where the snow, not the scene, is what matters. With a whopping 500 inches of frozen precip a year (on par with Alta) and slopes that are all but empty, you'll spend more time skiing powder and less time waiting in line for it. You also get sweet views of the badass western side of the Tetons, a new high-speed quad on Peaked Mountain that added 500 acres of terrain, and lift-ops who'll massage your shoulders (if you're a girl). Targhee doesn't have huge bowls, epic bump runs, or an expansive back side. But it does have glades, from thick spruce to small stands of aspen, and rock-lined chutes. And with the new Sacajawea lift, you can now access a gnarly cliff band with a dozen hairy routes. At 9:30 am, I went up in the high-speed Dreamcatcher lift and licked my chops at what lay beneath me: 2,000 acres of wide-open, ski-wherever-you-want terrain, perfectly tilted from top to bottom, dotted here and there by clumps of spruce or aspen trees—a huge playground, and barely anyone to share it with. While weekend skiers had tracked through a fair portion of the ungroomed snow, upon closer examination, I found piles of boot- to knee-high powder nearly everywhere. Cody Wyo. — Nestled in the high mountains outside Yellowstone National Park sits one of the region's best kept secrets. But if you're looking for gondola rides and $90 ski passes, the Sleeping Giant Ski Area probably isn't for you. BOZEMAN MONTANA • "Bozeman is the perfect mix of ski town and skitropolis; it's more affordable than Jackson Hole, less crowded than Salt Lake City and more of a real town that Whistler. "Thus begins Powder magazine's glowing review in of Bozeman in its November cover story on the "Top 20 places to live to ski." BIG SKY, MONTANA • Big Sky Resort is celebrating this week after being highlighted in numerous national ski publications, including an image of Lone Peak appearing on the cover of Ski magazine. Ski magazine, a Bonnier publication with a national circulation of 450,000, released its fall special issue resort guide with a photo of "perfect corduroy" beneath Big Sky's "rugged" Lone Peak. (See photo, left.) 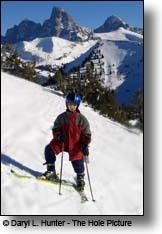 The image was taken during the 2009/2010 ski season by Public Relations Manager Chad Jones. "Big Sky's Lone Peak really stands out from other ski resort landscapes," says Jones. "It's the towering, singular mountain that really makes Big Sky who we are. I'm always looking for a way to get that iconic image out there, and was thrilled when Ski's editors decided to feature it on the magazine's cover this fall." Jackson Hole is located in western Wyoming near the Idaho border and about 40 miles south of Yellowstone National Park. The resort is twelve miles from the town of Jackson (the development at the base area is called Teton Village) and 250 miles north of Salt Lake City, Utah. Grand Targhee is located in the Targhee National Forest at 8,000 feet in the high country of the Tetons and it takes an effort to get to. Famous for its elbow room and consistently superb ski snow conditions that produces more than 500 inches of snow a year, Targhee has two mountains to choose from. 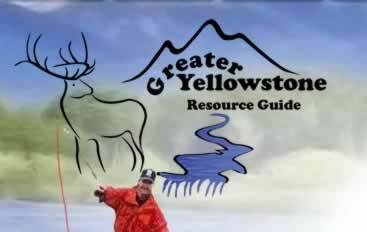 Grand Targhee is located 40 miles north of Jackson, Wyoming, and 87 miles east of Idaho Falls, Idaho. The Targhee Express provides regular bus service between Targhee, the town of Jackson and Teton Village (home of the Jackson Hole resort). GRAND TARGHEE, Wyoming (AP) -- Bill Royall chose the University of Denver so he could take the winter quarters off from school and hit the slopes.Grand Targhee has an annual snowfall of nearly 500 inches, with up to 650 inches in the whitest of winters.................................His powder-searching ways continued after college, landing him in Vail for a few years before it eventually became too crowded, too trendy. A move to Aspen ended with the same claustrophobic result. And so it went, Royall's quest for a quiet skiing sanctuary going on for years, taking him to places like Steamboat Springs, Taos, Sun Valley. And it always ended the same: moving out when the crowds moved in......................................The nomadic journey seemed to come to an end about 20 years ago when he arrived in Jackson, Wyoming, a place still oozing with that dusty-floor saloon charm of the Old West.....................................But, like all the other ski towns that had lured Royall with its charms, Jackson changed, attracting fuzzy-jacket-wearing out-of-towners to the slopes and trendy shops with pricey paintings and sparkly T-shirts lining the streets. Snow King ski area is located right on the edge of the town of Jackson, which is 12 miles from the Jackson Hole resort. 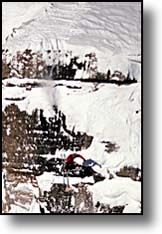 Kelly Canyon offers a snowboard park that is well lit and does not allow skiers in the area. Night skiing is allowed five nights a week. 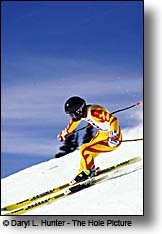 Ski discounts to military personnel and college students. Kelly Canyon is located northwest of Idaho Falls, off Highway 26. From Idaho Falls, take Hwy 26 to the Wyoming border and then head towards Jackson Hole, WY, follow directional signs to Kelly Canyon Ski Hill. 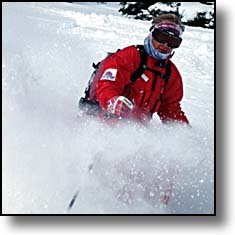 The 1998/1999 season marked Pebble Creek Ski Area's 50th Anniversary. Pebble Creek is a vertical playground that attracts extreme skiers/boarders, but also offers plenty of variety for all skill levels. Located just south of Pocatello, Pebble Creek plays host to 1,100 permitted acres, 45 runs, an abundance of annual snowfall and virtually non-existent lift lines, which provide enough playful terrain for beginners or those demanding an honest challenge. snowboards and Saturday night lessons. Pebble Creek is located 15 miles from Pocatello via I-15 south to the Inkom exit, then 5 miles to the resort. Red Lodge Mountain Resort Pure and Simple. No lift line, no attitude, no big prices. Just great snow, great people and an authentic experience in the big mountains. Red Lodge Mountain Resort has a long history dating back to 1960 when the ski area first opened. We are above all, a down to earth ski area that prizes skiing over glitz and glamour. Originally started by a local enthusiastic ski club, we have spent the last 50 years growing into a resort that attracts visitors and families from all over the country. For those who seek an un-crowded, authentic ski experience where one can truly relax and have fun, Red Lodge Mountain Resort is the mecca. The Mountain offers something for everyone - from beginners on Miami Beach, to intermediates skiing Lazy M (our 2 ½ mile signature run), to the experts looking for a challenge in the double black diamond chutes of Cole Creek. Our full service lessons, complete rental/repair services, gift shop, two bars, two cafeterias, and one restaurant round out our amenities that will fulfill everyone’s needs. One look at our events calendar and you’ll see we have a whole lot of fun all winter long. So once again, welcome to this really special place and from all of us at Red Lodge Mountain Resort, we wish you a very enjoyable stay. Give us a call anytime and we’ll be happy to help you in any way we can. Originally opened as the Red Star Camp in the winter of 1936-37, Sleeping Giant Ski Area officially opened in 1938 and is one of America's oldest ski areas. Today we have a unique terrain park, twice the vertical from the old days, challenging tree skiing & boarding, a carpet for those just starting out and all of this just 3 miles from Yellowstone National Park. There is a real sense of family here. Lots of stories from yesteryear. If its not the uncrowded slopes that will convince you, it will be all the spectacular wildlife you see when you drive up from Cody, this place has a certain vibe that you won't find anywhere else. Check us out this winter! Bridger Bowl, Montana, is the gem of the Northern Rockies. Located only 16 miles north of Bozeman, Montana, this outstanding ski area is well known for offering some of the most exciting ski, snowboard and telemark experiences that you will find, anywhere. This is not your typical Montana ski resort. Bridger Bowl is a nonprofit community ski area offering a great ski experience at an affordable price. Bozeman is home to Montana State University and is a young active community located only 90 miles from Yellowstone National Park. Bridger Bowl is located 16 miles north of Bozeman, Montana on Highway 86. It is an easy 20 minute drive on a well maintained road that provides one of the easiest and most scenic accesses to a major ski area that you will ever experience. Big Sky Resort lies nestled in the heart of the Rocky Mountains underneath majestic Lone Peak. In 1995/96, they added the Lone Peak Tram to better facilitate visitors for years to come. 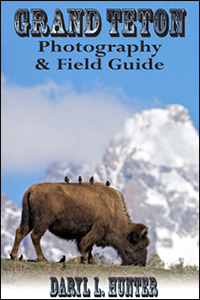 Surrounded by the Yellowstone Ecosystem, there is nothing small about the area. The wonders of the area are best enjoyed from the rustic luxury the resort provides. Big Sky Resort has some of the best snow on earth to ski on. 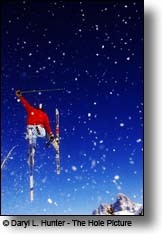 Big Sky was rated #8 in North America in Skiing Magazine's 2002 top spots. Big Sky is located in southwestern Montana, 43 miles south of Bozeman via Highway 191 and about an hour north of Island Park Idaho Via Highway 20 then north on Highway 191from West Yellowstone Montana. Big Sky Resort is nearest to the Gallatin Field Airport in Bozeman, Montana. This airport is approximately 45 miles N of Big Sky. Should you choose to drive to Big Sky, the resort is approximately 40 miles S of I-90. The turnoff is just W of Bozeman, through the beautiful Gallatin Canyon. From the south, Big Sky is 47 miles N of West Yellowstone on US Hwy 191.